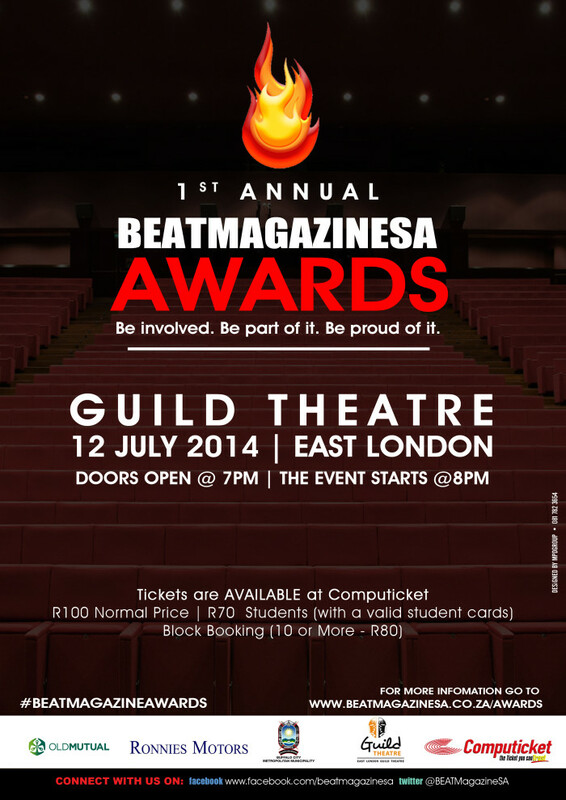 BEATMagazineSA Awards with a tagline “Celebrating Provincial Success” is an awarding ceremony presented by BEATMagazineSA to celebrate and honor outstanding contribution and achievements towards development of the Eastern Cape Province within a period of 12 months. This event is planned to take place annually in East London’s Guild Theatre. The schedule date the second Saturday of July annually. The ceremony will feature performances from local artists, dance groups, from the province to showcase their talent by enjoying the platform provided to them. This ceremony is aimed at promoting and encouraging all groups of people, organisations, departments and individuals to contribute to the development of the Eastern Cape. Secondly, to attract investment opportunities to the province as it will bring attention to the Eastern Cape due to its media coverage. The slogan is: Be involved. Be part of it. Be proud of it. Is derived from the above mentioned statement to better and develop possible opportunities for investment in the area. Events are known to have economic spin-offs that will lead to creation of seasonal and permanent employment to the host city or area. Secondly these awards are about bringing pride back to Eastern Cape citizen by creating a platform where they can see local talent being awarded and showcased in front of their eyes. This will bring back the sense of belonging to the citizens, as it will grow bigger and better as time goes. BEATMagazineSA Awards are planned to be one of the biggest event ever to be hosted and implemented by an Eastern Cape owned entity with a mandate to develop and encourage local content, which will leverage future benefits to the province. This event is aimed at touching thousands of Eastern Cape citizens, who will attend the event and experience it live and those who aspire to be there. This event is the first of many to be hosted and it will place Eastern Cape on the South African map, as it will set the province to be on list of developing areas in the country, besides Gauteng, Western Cape and Kwa-Zulu Natal. BEATMagazineSA will ensure that all parties involved receive the spin-offs from the development of this amazing ceremony that will take place on the 12th July 2014 in Guild Theatre. The event is made possible with generous support from official event sponsors Ronnies Motors and Old Mutual, who saw a good developmental project that they can support at grassroots’ level. Buffalo City Metropolitan Municipality is the host municipality as the awards will take place at Guild Theatre, in East London. Tickets for the awards are available now at all computicket outlets (Shoprite, Checkers, Money Market, House and Home, Guild Theatre and Online). All tickets cost R100, with student discounts and blocking booking discount. For instance when booking 10 or more ticket you will receive 20% off each and every ticket bought, as for students with valid student cards 30% will be take off their tickets. Buy a ticket between the 5- 31 May and stand a chance to co-present an award on the 12th of July 2014.